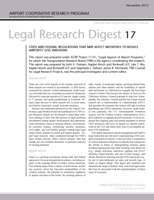 On December 26, 2012, the Transportation Research Board published ACRP's Legal Research Digest 17: State and Federal Regulations that May Affect Initiatives to Reduce Airports’ GHG Emissions, prepared by the Firm. The Digest provides an introduction to legal issues that are relevant to implementing GHG mitigation measures at airports. Specifically, it describes the various sources of GHG emissions that are generated from airport-related activities; it summarizes the federal, state, and local laws that are most likely to be implicated in the implementation of GHG mitigation measures; and it explains how these laws may apply to specific measures.